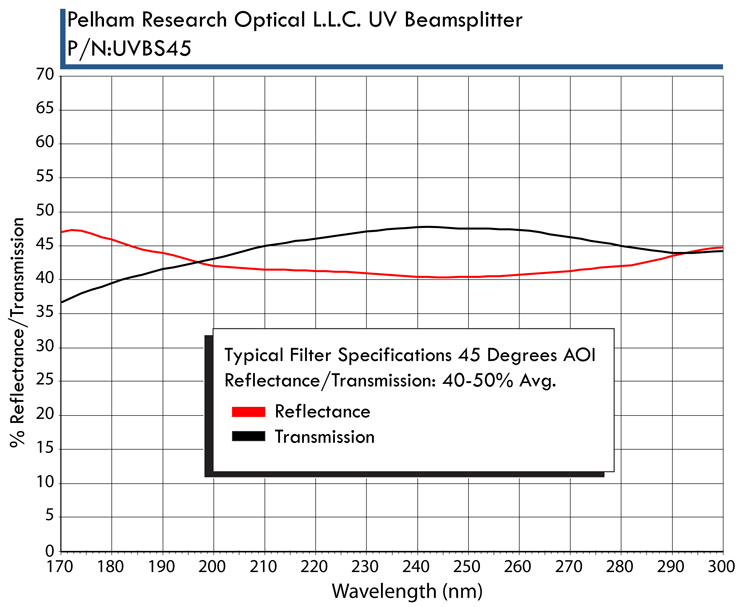 Pelham Research Optical (PRO) manufactures a Broadband UV Metallic Beamsplitter (UVBS) from 170nm to 300nm @ 45 degrees AOI with 40% to 50% average reflectance and transmission. These UVBS filters can not be covered and edge sealed. They are supplied as open-faced filters only. PRO UVBS coatings can be applied to different sized substrates to meet your instrument requirements. The light beam must enter the coated surface (reflective side) first. Metallic beamsplitters are very broad so they can cover a larger wavelength than dielectric beamsplitters. Due to their metallic coating UVBS are designed for low power applications. 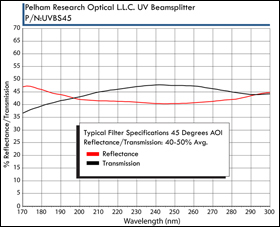 All Pelham Research Optical filters are supplied with individual VUV-UV % reflectance/transmission calibration curve detailing their VUV-UV spectral performance.